« WWII Doolittle Raiders making final toast-and what Mrs. Schechter saw. Hell came in like a freight train. Veterans’ Day 2013. I am reposting this today for Veterans’ Day 2013. Also tune into CBS 6 Albany NY at 6pm this evening for a feature story on him. Frank was in the 30th Infantry Division, which liberated the Train Near Magdeburg; he came to our school. The morning of December 16, 1944. A lonely outpost on the Belgian frontier. In subzero temperatures, the last German counteroffensive of World War II had begun. Nineteen thousand American lives would be lost in the Battle of the Bulge. “Hell came in like a freight train. I heard an explosion and went back to where my friend was. His legs were blown off-he bled to death in my arms.” The average age of the American “replacement” soldier? 19. Of the sixteen million American men and women who served in WWII, four and a quarter hundred thousand died on the field of conflict. In 2011, nearly 1000 veterans of World War II quietly slip away every day. The national memory of the war that did more than any other event in the last century to shape the history of the American nation is dying with them. The Germans threw 250,000 well trained troops and tanks against a lightly defended line on the Ardennes frontier in Belgium and Luxembourg, which created a pocket or “bulge” in the Allied offensive line, the objective being to drive to the port of Antwerp to split the American and British advance and force a separate peace with the Western Allies. What ensued was the bloodiest battle in American history. It saddens me that it comes as a shock to many Americans today that the “Battle of the Bulge” didn’t originate as a weight-loss term. On a personal note, I have had the privilege of interviewing many of the veterans of this battle. In the high school where I teach, I have been inviting veterans to my classroom to share their experiences with our students. As their numbers dwindled, I smartened up, bought a camera, and began to record their stories. 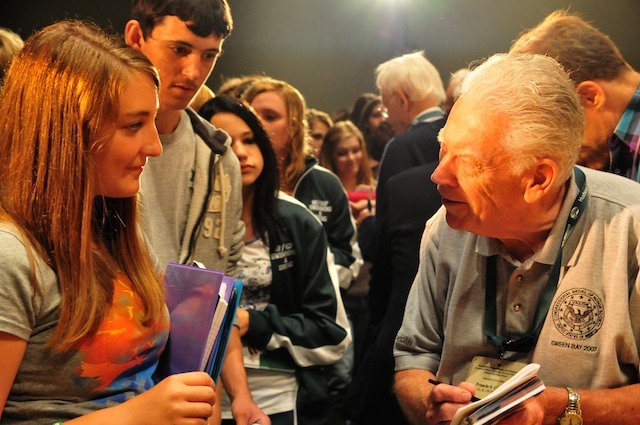 And for the past decade, I have been sending kids out into the field to record the stories of World War II before this generation fades altogether. These men and women have helped to spark students’ interest in finding out more about our nation’s past and the role of the individual in shaping it. On our website we have worked to weave the stories of our community’s sacrifices into the fabric of our national history. And that, to me, is what teaching history should be all about. After all, if we allow ourselves to forget about the teenager who bled to death in his buddy’s arms, if we overlook the sacrifices it took to make this nation strong and proud, we may as well forget everything else. I shudder for this country when I see what we have all forgotten, so soon. But if you are taking the time to read this post I suppose I am preaching to the saved. I will close with the account of a nineteen year old infantryman who in fact survived the battle and the war, and who I was able to introduce to many Hudson Falls students on more than one occasion. Sixty-nine years ago this December, a day began that would forever change his life. 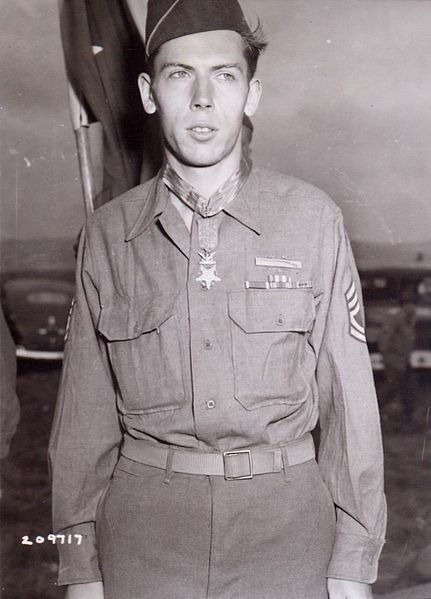 Frank is now the only living Medal of Honor recipient from World War II left in New York State and New England. In the winter of 1944, nineteen year old Private First Class Currey’s infantry squad was fighting the Germans in the Belgian town of Malmédy to help contain the German counteroffensive in the Battle of the Bulge. Before dawn on December 21, Currey’s unit was defending a strong point when a sudden German armored advance overran American antitank guns and caused a general withdrawal. Currey and five other soldiers—the oldest was twenty-one—were cut off and surrounded by several German tanks and a large number of infantrymen. They began a daylong effort to survive. 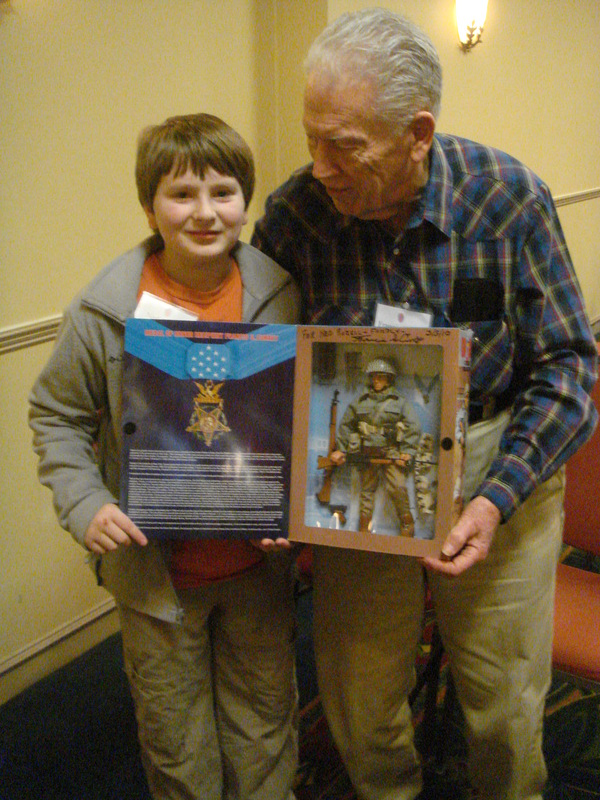 Francis Currey MOH and Ned Rozell March 2010-Ned is friends with the last WWII Medal of Honor recipient in NY and NE, Frances Currey. Yes, the special edition GI Joe he signed for Ned is 19 yr. old Frank! The six GIs withdrew into an abandoned factory, where they found a bazooka left behind by American troops. Currey knew how to operate one, thanks to his time in Officer Candidate School, but this one had no ammunition. From the window of the factory, he saw that an abandoned half-track across the street contained rockets. Under intense enemy fire, he ran to the half-track, loaded the bazooka, and fired at the nearest tank. By what he would later call a miracle, the rocket hit the exact spot where the turret joined the chassis and disabled the vehicle. Moving to another position, Currey saw three Germans in the doorway of an enemy-held house and shot all of them with his Browning Automatic Rifle. He then picked up the bazooka again and advanced, alone, to within fifty yards of the house. He fired a shot that collapsed one of its walls, scattering the remaining German soldiers inside. From this forward position, he saw five more GIs who had been cut off during the American withdrawal and were now under fire from three nearby German tanks. With antitank grenades he’d collected from the half-track, he forced the crews to abandon the tanks. Next, finding a machine gun whose crew had been killed, he opened fire on the retreating Germans, allowing the five trapped Americans to escape. Deprived of tanks and with heavy infantry casualties, the enemy was forced to withdraw. Through his extensive knowledge of weapons and by his heroic and repeated braving of murderous enemy fire, Currey was greatly responsible for inflicting heavy losses in men and material on the enemy, for rescuing 5 comrades, 2 of whom were wounded, and for stemming an attack which threatened to flank his battalion’s position. At nightfall, as Currey and his squad, including the two seriously wounded men, tried to find their way back to the American lines, they came across an abandoned Army jeep fitted out with stretcher mounts. They loaded the wounded onto it, and Currey, perched on the jeep’s spare wheel with a Browning automatic rifle in his hand, rode shotgun back to the American lines. After the war in Europe had officially ended, Major General Leland Hobbs made the presentation on July 27, 1945, at a division parade in France. source material “Medal of Honor: Portraits of Valor Beyond the Call of Duty by Peter Collier. Frank signs autographs at our school. I feel fortunate and honored to have met Frank numerous times at the 30th Infantry Division Reunion that I attended with and for my father, Richard Denlinger, a veteran of the 30th Infantry Division. I’ve also had the privilege of getting to know Matt Rozell. He has made a difference in so many lives. You never know what life will bring!